In Monroe, Treehouse Vineyards offers a selection of sips, and a special place to enjoy them — several cozy cabins, high in the trees. Growing up on a tobacco farm near Benson, Phil Nordan loved to build tree houses, platforms high above the ground, with zip lines made from old power lines for speedy descents back to earth. Years later, Phil is still building things. 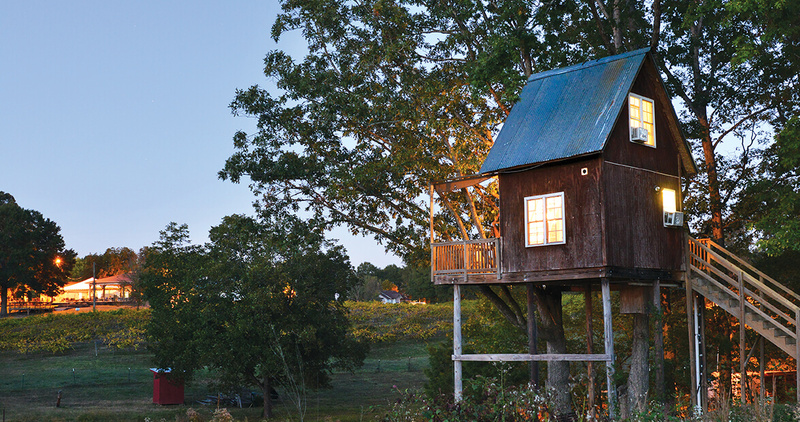 He and his wife, Dianne, own Treehouse Vineyards in Monroe, where the namesake structures aren’t simple platforms in the sky — they’re tree houses, all grown up. Inspired by Pete Nelson, of the show Treehouse Masters, and driven by his lifelong passion for building, Phil first constructed the multi-platform Date Nite Treehouse using extra lumber he had stacked outside, and wood from his father’s old tobacco barn. Initially, it was just for himself and Dianne — “We needed a place to share a bottle of wine and watch the sunset,” Dianne says — but when the winery opened to the public in 2010, the Nordans began renting the space to visitors. They designed Papa’s Dream House to accommodate their personal guests, including Dianne’s extended family. Soon, people started asking if they could rent that one, too. Bright red and cozy, Papa’s Dream House is only about 160 square feet. There’s a couch, a tiny kitchen, and a bathroom downstairs, and a steep ladder to a bedroom loft upstairs. On the deck, a grill, a table, and a hammock overlook the pond and the vineyard. That pond was once a rock quarry belonging to Dianne’s grandfather, who leased it to the city of Monroe during the Great Depression. The rocks from the quarry were used to pave the town’s roads until the early 1950s, meaning Dianne’s family’s influence can literally be found in the streets of Monroe. Today, the winery influences the town in other ways. As one of the few attractions in the area, Treehouse Vineyards brings about 1,000 people per week to Monroe for tours, tastings, live music, trivia, private functions, or just a relaxing evening out. 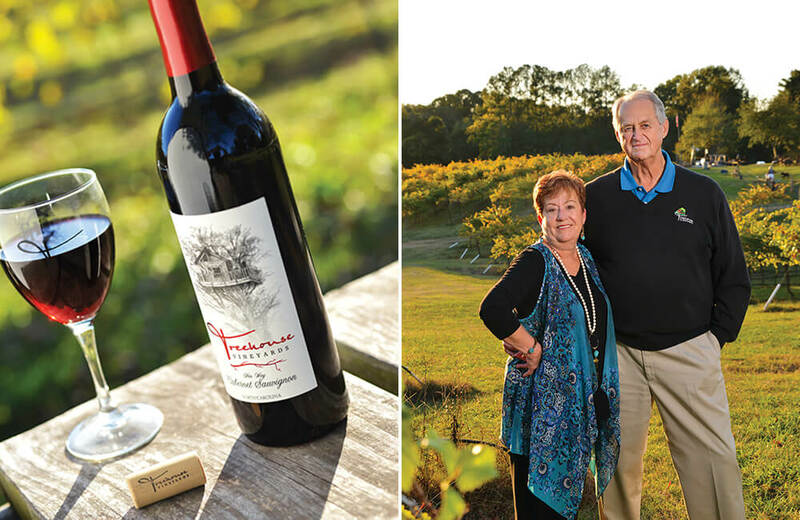 Visitors from the Charlotte area and beyond come for the award-winning wine. Phil started making wine at home about 30 years ago — “It’s kind of a hobby that got out of hand,” he says — but it wasn’t until 2005 that he planted the vineyard. The Nordans grow muscadines, which are better acclimated to the warm Piedmont climate than grape varieties used in traditional reds and whites. That, coupled with high-quality, low-nitrogen soil, means that the Nordans never have to spray their plants with pesticides. Healthy, organically fertilized muscadines are the Nordans’ specialty. But it’s the tree houses that make this place so memorable.